Tom Stoppard‘s The Coast of Utopia is an extraordinarily ambitious three play trilogy on the intellectual background of the Russian revolution, consisting of Voyage, Shipwreck, & Salvage. Covering a massive amount of historical material, the entire trilogy is a nine hour marathon of intellectual drama. When it played in repertory in New York in 2007, it won seven Tony Awards, the most ever given to a play. It ran for 124 performances and was characterized by Ben Brantley of the New York Times as “the season’s ultimate snob ticket”. Shotgun Players‘ West Coast premiere of the first of the trilogy, Voyage, is an unwieldy mass of information, with some lovely moments in the midst of confusion. The play revolves around the family Bakunin, of the Russian nobility. All of the members of the family are under the influence of the intellectual foment that will eventually lead to revolution. They are educated and culturally sophisticated and their conversations and friendships reflect the changing world in which they live. The performances in this production, however, fail to capture the wit, charm and high culture reminiscent of Chekhovian drama that Stoppard surely intended. It is difficult to believe that this loudmouthed family, shouting everything and clarifying nothing, possess much insight at all. Very little is communicated other than that these people are rich. Instead of giving us genuinely charming and educated aristocrats, we get a great deal of indicating in an unsatisfactory imitation of the style of “Masterpiece Theatre”. It seems as though much more attention has been given to the body language of the servants and the details of the table settings and linens and how they are managed than to the difficult and complicated text. It is mostly symbol with little substance. 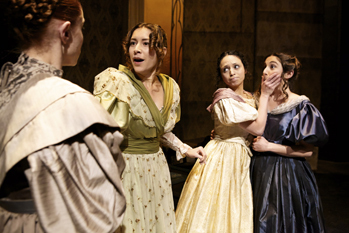 (L to R): Christy Crowley, Leanna Sharp, Nesbyth Rieman, Caitlyn Louchard as the Bakunin sisters in Tom Stoppard's "Voyage" at Shotgun Players. Photo Credit: Pak Han. There are occasional glimpses of what might have been. Zehra Berkman as matriarch Varvara Bakunin has many lovely moments with her husband Alexander Bakunin (played by John Mercer) and several particularly telling interactions with the household servants. Late in the evening an excellent Yahya Abdul-Mateen II appears as the young Ivan Turgenev. His performance is natural and specific. He appears to have wandered in from another, more successful production. Unfortunately, he arrives too late in the Voyage to save this sinking ship. The tone of this production is too general and lacking in clarity to successfully educate an audience about the intellectual issues raised and the interesting historical figures portrayed. However, fans of Tom Stoppard who are willing to look past the flaws of this production will be interested in this opportunity to view the West Coast premiere of this famous play, and serious students of the intellectual history of the Russian revolution will be fascinated. Otherwise, this Voyage may leave audiences feeling altogether too much at sea. “Voyage” by Tom Stoppard, produced by Shotgun Players. Director: Patrick Dooley. Technical Director: Anne Kendall. Set: Nina Ball. Fight Consultant: Dave Maier. Costumes: Alexae Visel. Sound: Matt Stines. Lights: Ray Oppenheimer. Ivan Turgenev: Yahya Abdul-Mateen II. Nicholas Stankevich: Adrian Anchondo. Varvara Bakunin: Zehra Berkman. Baron Renne/Polevoy/Ginger Cat: Kevin Clarke. Liubov Bakunin: Christy Crowley. Miss Chamberlain/Katya: Britney Frazier. Masha/Mrs. Beyer: Anne Hallinan. Alexander Herzen: Patrick Jones. Nicholas Ketscher: Chris Kristant. Stepan Shevyrev: Matt Lai. Sazonov/Dyakov/Pavel/Assistant Director: Ben Landmesser. Tatiana Bakunin: Caitlyn Louchard. Natalie Beyer: Casi Maggio. Vissarion Belinsky: Nick Medina. Alexander Bakunin: John Mercer. Alexandra Bakunin: Nesbyth Rieman. Peter Chaadaev: Richard Reinholdt. Michael Bakunin: Joseph Salazar. Varenka Bakunin/Dance Consultant: Leanna Sharp. Semyon: Alex Shafer. Ogarev/Sergei/Assistant Director: Sam Tillis. Posted in Reviews.Tagged AlexaeVisel, Alexander Herzen, Anne Kendall, Ben Landmesser, Caitlyn Louchard, Chris Kistant, Dave Maier, Matt Lai, Nicholas Ketscher, Nina Ball, Patrick Dooley, Patrick Jones, Shotgun Players, Stepan Shevyrev, The Coast of Utopia, Tom Stoppard, Voyage. Next Post PianoFight Productions: WTF?